The Sigma 85mm F1.4 Art hasn't been on the market long, but it has already begun to make some serious waves. Lenstip and DxO have rated it the sharpest 85mm lens ever created, beating out even the legendary 85mm F1.4 Zeiss Otus, which isn't something that we take lightly. 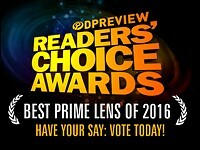 We were lucky enough to get our hands on the lens back in mid-November and we were very impressed to say the least, so much so that it took top honors for the 'Best Prime Lens of 2016' as chosen by our staff. It has, without a doubt, been a pretty big topic of discussion not only amongst our staff members, but also amongst portrait photographers around the world. With that said we just had to get our hands on it to see how it really performs and to see how it holds up next to some very stiff competition at 85mm. The Sony FE 85mm F1.4 GM is a very formidable competitor and arguably the best modern 85mm F1.4 on the market (behind the manual focus Zeiss Otus, of course). With that in mind, the question is; can the Sigma hold its own? Our review will answer that question and more. With an equivalent focal length of 136mm and an equivalent aperture of F2.2, this lens can be used on an APS-C camera. Even with its slightly longer focal length, it does still fit into the focal range that's often used by portrait photographers and the fast aperture does allow for it to be used in low-light situations as well. However, its size, weight and price makes it worth considering 85mm F1.8 lenses instead. As you can see the lenses are fairly different in terms of build and design. The Sony 85mm has a manual aperture ring that can not only function on its own, but the aperture can also be adjusted with the camera by switching the ring to 'A'. This ring also features a special de-click feature for smooth, silent aperture changes while shooting video. The Sigma 85mm lacks the weather sealing that the Sony has and there's also a fairly substantial difference in size and weight as the Sony 85mm is a fair bit smaller and lighter. The price point is one area of the where the Sigma really prevails over the Sony, on paper, at least. 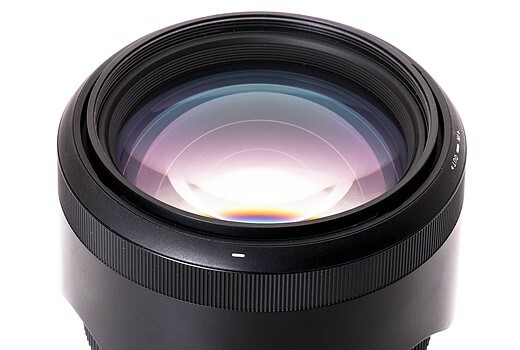 Specifications are fun to look at, but the real question is how do these lenses perform? Read on, to find out. Not as great as a Leica but not bad. in the photo above, the sony is actually sharper on the right side of the frame. on the left side the sigma is sharper. is this because of the adapter, like said in the caption? or is the lens suffering from decentering or something? i assume its the adapter, hopefully. That lens is huge. With airline restrictions and having to unload bags at airports when traveling, it's not fun hauling all this gear around! I don't get why Sigma is not starting to weatherseal their lenses finally. I have the 35mm, but in some occasions I don't use it due to this absence of sealing. Surely they target the high-end market with their lenses, why not scoring well on this regard too? That being said, if cost would be no factor, I would choose the Sony. Weathersealing, size, weight and the bokeh are more important to me than image-technical differences which are negligible. Both lenses are the best you can get. And the clients will in no case have anything to complain about. I don't get it either. It is becoming commonplace with most manufacturers, so why is Sigma leaving this one little feature out that can make such a difference to many customers. You guys are missing a huge opportunity by not mounting this lens on a Merrill....who knows how the elves in the Sigma lab have synergized the interaction between their amazing foveon sensor and the wonderousness of this lens? Who knows? Nobody, that's who because no other review site has the courage to dare try such a combo. Go for it! Literally like 12 people bought Merrill cameras. [triggered] It's a collector's item!! 14. I own two of them. And? Does it live up to its potential? Have updates in firm- and software made them worth seeking out? It would be interesting to see if they could spur sales of their bodies and grow the mount by selling this for the Sigma mount at cost. A lot of people would potentially be interested in getting a lens lineup that was nothing but art lenses at a discounted price. Is a perfect example of why sharpness isn't something at the top of my list for a portrait lens. I'm still using a Nikon 85mm f1.4D because of the rendering and how little PP the files need -for portraits-. If I was going to go out and shoot buildings, yeah, I'd use something else. Agreed. A sharp portrait lens is great, but a lens that's super clinically tack sharp isn't always the most flattering or ideal choice (unless the subject has flawless skin). True, but it's always easier to soften an image than to sharpen. When you have a fast car it doesn't mean you always need to drive as fast as it can. One may want to have details in the eyes and hair. Or in little hairs on the skin. And for precise post processing lots of detail can help, just to split unwanted detaisl from pretty details. Maybe its not a lens for out of camera pleasing Portraits, but then a much cheaper lens will do the Job just as well, I agree. The problem isn't specifically they are "too sharp, it's that they give up other optical qualities like bokeh or smooth focus transitions to achieve this sharpness. And as someone who does this for pay, I would MUCH rather get almost "good to go" shots out of the camera than have results that require a lot of post processing to bring a difference to the table that can only be seen pixel peeping. The end consumer is 99% of the time looking at an 8X10 print from a portrait shoot and this pixel peeping sharpness will never be seen. The other optical qualities will be. Both lenses show decentering. Sony is much worse on the left and the Sigma is a little worse on the right. I'd hate to spend that type of money and get that result. That large, knurled ring running around the circumference of the lens is for manual focus. To ignore the manual focus aspects of the respective lenses seems a glaring omission. Indeed. Still photos are rapidly becoming an anachronism; the world is going video and manual focus smoothness, throw, and precision are the new hallmark of a great lens. I did some home tests for this characteristic on my lenses and the old Sigma 85/1.4 is may be similar in this regard or a bit better. Canon 135/2 is magnificent in this regard. Maybe it's just me but the Sony is also doing cat's eyes when wide open, I think this has been pointed out in the review. Not as much as the Sigma wide open but the difference is small. Certainly, neither does retain the perfect roundness of the background lights at 1.4. At f/2 and up they both appear to be circular. So I don't see why the Sony would be able to do a nice bokeh pano while the Sigma is "not usable at all". I have the Sigma (Canon mount) and shot some maternity photos of my wife in front of the Xmas tree. I did it at f/2 and the bokeh lights on the tree in background are perfectly circular all the way to the corners. It is not nice if you do bokeh panorama/brenizer. 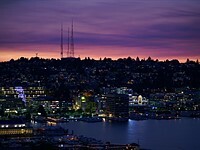 I use the older non Art Sigma 85/1.4 and panoramas stich ok. Also the Canon 135/2 is doing well. As you can see in my test the Zeiss Batis and the other lens I tested produce similar cat's eye effect on the bokeh making stitching harder if not impossible. For other things the Sigma is probably well worth it. I think it just comes down to what your goal is and what's the best way and tool to achieve it. Like I said, at f/2 both the Sony and the Sigma produce perfectly round bokeh highlights. So they both are suitable for panos in my opinion based on that logic. In that case it comes down to which has less distortion since that may also affect panos I presume. We also know that at wide open both the Sony and the Sigma produce cat's eyes, so neither is optimal for panos wide open. So in my opinion, if someone is planning on doing bokeh panos with either of these lenses, he/she needs to stop down to f/2 to make it work. So here we go, both lenses do the job equally well in this case. I also own the older Sigma 85 f/1.4, the Canon 135 f/2L, and the Canon 85 1.8. I never tried doing panos with any of these lenses, but if you say that the 135 f/2 is the best out of these then I'd use that for stitched panos, simple as that. Even factoring in the significant price difference, the Sigma's size, weight and the inconvenience and disadvantages of adaptors make it almost not worth considering on the A7 series. The GM is large and heavy enough. The Sigma's performance advantages are too small to put up with the size and weight increase. If I was wanting to save money, I'd buy the Batis instead, which will do 95% of what the Sigma will do at less than half the weight. batis more like 1/3rd the weight if you factor in the weight of the adapter too. Batis also has OS which some people might appreciate. I'm assuming you meant save money over the GM, since the Batis is the same price as the Sigma. Anyway, I agree: the Batis is a fantastic native E-mount option for this FL. It weighs nearly 1.5 lbs less than the Sigma, doesn't have any major color fringing issues wide open, and it offers stabilization and weather sealing. The Batis is plenty sharp and contrasty enough for me, and it renders colors and portraits beautifully. Yep, save money over the GM. I use mine all the time on my A7RII. No issues, especially if you have the battery grip. I've been using the previous Sigma 85mm f1.4 lens. Very happy with the lens. Any chance of a direct comparision? I suspect that while the Art lens will have better allround specs, in RW shooting conditions the difference may be small. @David Roger Cicala did an MTF comparison in his article. There's really no comparison in terms of sharpness. I'm happy with the previous model as well, it's a wonderful lens. For portraiture, "significantly sharper" may not matter. And it certainly looks a lot smaller now, seeing how huge the new one is. :-) I'm glad to see Sigma producing new lenses though. I like having cheaper options than Canon. I would say the usable range for high IQ would be from f/2.0 to f/11. That scene would be tricky for any large aperture prime, but you don't need to view it at 100% to see the there is LoCA all over it. Low facing sun shots are all the thing at this moment. A setting sun sets mood and that why we see so many full and half portrait shots that are photographed directly or near directly into the sun. Therewith if you will use this specific lens you will probably get many chroma in your shots too.I personally find this lens unusable and nothing good compared to the other lenses in the Sigma Art range. Which I do like by the way. Its just that I find this 85mm a step back and more to what Sigma used to be a mediocre lens manufacturer. LoCA is one of those aberration that can be completely visible even in a small print. You can shrink that shot down to 6x4 size and you'll still see it on the railing and along the tiles. That's a lot of purple ! You are right that the CAs are very evident in your example, but I'm quite sure any 85/1.4 would perform something alike. And I've used a lot of them. That being said, that is even my most requested "feature" to improve before I buy a new 85mm. I don't care about the sharpness or vignetting or whatever, those are no issues for in practice. The Otus 85mm doesn't have any purple fringing. The only problem it has is OOF onion ring bokeh highlights. That is the only defect I've noticed. Well, considering the Otus is $4500, it better not have these problems! ;) In the Sigma's defense, if there was a scene to bring out the very worst of the color fringing, this would be the one. I agree that it's pretty bad here, though. I bet it would've cleaned up quite a bit stopped down to 1.8 or f2. I want this lens for my K1. Astonishing glas! I don't have a K1, there is such great third party lenses, but only for Casonykon :( I wonder what this lense can do when you use the pixels shift mode. Might be worth a test. Honestly I do not use Pixelshift so much. Sony "allowed" them to make something like this. But Sony has lots of trump cards. I have back ache from carrying my 50 1.4 Art around - and now its gonna double up! Still have to say its worth it with the 50. I wish Sigma make dedicated primes for APS-C sensors. like the 30mm F1. 4 art? 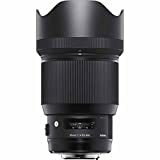 Why is a Sigma lens being compared to a Sony? Sigma does not make an e-mount so they are not compatible. 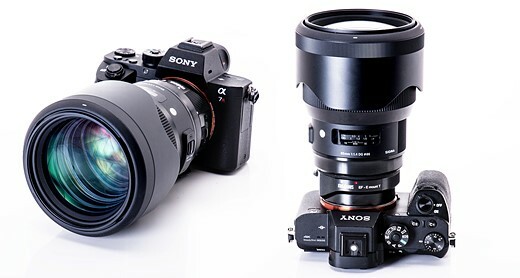 Comments like "Personally, I would choose the Sigma over the Sony" don't make sense to me because it's not a choice a photographer has (a lens adapter (even Metabones) is not a serious option. You lose much functionality and speed and of course it adds $400 to the bill). To me it would have made more sense to compare it to say the Canon 85mm 1.2. Thank you. Comparing to the Canon will be too embarrassing. Comparing to the Zeiss ones will be even more embarrassing, but Lenstip actually did compare this Sigma to the Zeiss and the Canon 85mm lenses and what a revelation! the canon will easily lose. by a great margin. Big & heavy. Should be fine on large DSLR bodies, but it looks unwieldy on Sony. Now, SIgma, make equally good but small and light f/1.8 version. @Eric hmm the lenses are close, but the Sigma is definitely sharper overall and it handles CA better as well at nearly every aperture. I think the links in the text do a fairly good job of illustrating that. That being said, both lenses perform very well. Really depends upon what you look at. For instance, at that "real world" shot (p.2) there seems to be much more places in *corners* at f/1.4 where Sony resolved noticeably more details. Although I'm pretty sure one can easily find places where that's not the case. So, "overall", I agree with what Eric said. P.S. I'm not going to get either lens -- I'm way beyond "bigger is better" period of my life... So I'm not fan of Sigma's approach of building monsters with huge image circles to improve IQ. That is not to say the approach is "bad": some pros might as well find its results valuable or even indispensable; good for them. All I'm saying is it's just not my cup of tea. whoa! he is right. Interesting. Sorry, Chris --I disagree. They are amazingly close in sharpness -but you had to have a "winner". My point is the sharpness is comparable, the CA control goes to Sigma, and the bokeh is smoother in the Sony. There is no winner -pay your money for one of these fine lenses. G Master bokeh is better but for 1/3 money less and better in almost all other performance checkboxes I think the choice is clear for many of us. Since you are not a Sony shooter, there is actually only a single choice between these two options, correct? Thinking aloud for a friend that's wondering which would be better for his A7RII. If I'm in the market for an 85 I would pick this over the Otus just because of the AF. Apart from the die-hard fans, I wonder who is going to buy the expensive manual focus Otus now. I have the Otus and I see nothing here that would signal regret. Despite the cost, weight and manual focus, It still makes me smile with every image. As @belle100 said. "die-hard fans. @flashback I don't see the lens listed in your gear selection here at DP? 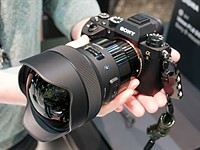 If the Sony was $1,200 I would prefer it over the Sigma. I mean lets give sigma props and all but their lens is much bigger and not sealed. The differences between them optically are pretty small. $600 isn't small but it's not like this makes the GM lens line any less impressive to me. Shame for all these hype of this lens. I was looking for a cheap copy of this when it doesn't sell many. Damn. What company makes lenses in the United States? Who cares? It's a portrait lens. Don't count in the adapter, by the way (and the reversed lens hood). Those fellas didn't photograph that lens with the hood on backwards, did they? That would be kind of an odd thing to do. Imagne how big it would look with the hood on right! This is how ridiculous digital photography has become: they told us before, in early 2000's, that digital cameras and optics will get smaller and more efficient, yet opposite is true. What was moderate in size has become big, and what was big has become enormous! What an utterly insane trend! It's partly one upmanship and marketing. But also it's due to the collapse of the low end market. With makers moving upscale to get more revenue from a minority, companies need some features they can boast about to get people to fork out big bucks. Making a small light lens that's only in the middle of the pack in terms of performance won't get people to pay a big premium. In the early 2000's, digital was roughly, though perhaps not quite, as good as film. Since then, sensor technology has achieved ridicoulsly high resolutions and ridicoulsly low noise levels. Lenses needed to be increasinly massive just to keep up. Pixel peeping at 42Mp is alot more demanding on a lens than pixel peeping at 6mp. Yes, but they still have lower res bodies that would benefit from a compact set of lenses. But except for the 28/2 and 35/2.8, I don't see Sony going in that direction. Not enough demand and not enough revenue. Not enough demand for massive, expensive lenses? Or not enough demand for light, cheap lenses? "... they told us before, in early 2000's, that digital cameras and optics will get smaller and more efficient"
You should buy a smartphone. Yup, the Google pixel would probably give the 10Ds a run for its money. If sensors are demanding, well f1.8 are always lighter, easier to use , better corrected, better quality. See the Nikon 85 f1.8 which is better than the f1.4. Its because today's buyers that are willing to drop $1K+ for a lens demand that the lens is usable wide open. To make this happen, you have to use a ton of glass to correct aberrations, plus the glass needs to cover even more than the sensor so the sweet spot of the lens now covers more of the frame than just 1/3 of the center portion. It is what it is... this is brute force to get insane image quality, not unlike brute forcing more transistors onto a graphics card that takes up as much power as a small air conditioner to push higher fidelity graphics in a computer. @danslic: Sony just released the FE 85mm F1.8. I'm speaking about why Sigma is releasing an 85mm F1.4 lens which is bigger and heavier than the Sony F1.4 or even the Canon F1.2. How does the Canon perform at f/1.2? Poorly. The Sony is slightly back focused. Also, on the portrait comparisons, one of the lenses looks vignetting corrected, the other one - not. I think so too. I had a slight confusion on the DoF but with you stating the same, I feel its back focused too. The lenses are getting bigger and heavier with each new version. Soon you'll have to hire an extra Sherpa to carry your gear. Wow Carl ... does your car follow you down trails, into buildings, and up stairs? @StevenE That is how ridiculous digital photography has become. It has become a blatant lie: they told us before, that digital cameras and optics will get smaller and more efficient, yet opposite is true. What was moderate in size has become big, and what was big has become enormous! Triplet ... I think it's great that some top notch gear is coming out, but I am willing to let go of a little IQ in order to gain some portability. Something along the lines of the Tamron 85 f/1.8 IS is good. Personally I went for the Canon 35 f/2 IS over the various f/1.4 lenses because of it's size, and inclusion of IS, not to mention the cost saving. If someone was paying me $5000 for a portrait session, I'd probably run out and immediately buy this Sigma. "If someone was paying me $5000 for a portrait session, I'd probably run out and immediately buy this Sigma." Why? So you can spend hours using skin smoothing software? You really think women like photographs of themselves that show every pore? Do you ever see that kind of "extra sharp" portraits of women in advertising? This obsession with sharpness in a portrait lens is.... just silly. Good on you Sigma. You've made a huge leap from a mediocre third part manufacturer to a top quality alternative. Take another look please at 100% - This result is even less then mediocre. This lens is being hyped and overrated imho. Fujica: That's it? The worst example you can find? I saw it pointed out before and it's still alright. Of course it's no apochromatic Otus but otherwise great lens. the fringing is much higher in the nikon 85 1.4g lens which I was going to buy..till I heard the sigma art was going to be announced. then it was on hold and now the art is going in my bag. How many people reading this think it means speed and not just depth of field? On APS: "With an equivalent focal length of 136mm and an equivalent aperture of F2.2"
But feel free to expose as if it was f/2.2, you'll have every shot overexposed by more than a stop. @OlyPent, looks like you are seriously confused. What it means is that if you put 85/1.4 on APS-C and 130/2.1 lens on FF you get identical images in terms of FOV, DOF, photon noise, motion blur at the equivalent settings, i.e. f-stop*crop, same shutter speed, ISO*crop^2. All I said was that if the illumination of the scene requires (for example) 1/125th second at f/1.4, it will be the same across all sensor sizes, that sensor size has nothing to do with f-ratio and exposure time required for the image. ... and aperture by the way. How to end this display of optics ignorance by those who glibly state focal length is affected by sensor size? It may be so ingrained as to be hopeless except for those who truly want to know how things work. Correct. Your exposure will be off. Sensor size has nothing to do with exposure. And, to make it even more confusing, camera makers lie about ISO, f-stop, and guide numbers, overstating all three. Maybe the starting point should be to google "equivalent". OlyPent: "All I said was that if the illumination of the scene requires (for example) 1/125th second at f/1.4"
Here is your first error. Camera cannot require no such thing. Camera may measure 1/125 @ f/1.4 @ ISO100 or 1/125 @ f/2 @ ISO200 or many other combinations. It's not a camera it's a photographer's job to select the shutter speed and aperture suitable for the subject. And here is something you have difficulty understanding. If you chose 85mm lens and 1/125 @ f/1.4 @ ISO100 on APS-C camera you will get same results using 130mm lens and 1/125 @ f/2.1 @ ISO200 on FF camera. I do, speed is what matters to me, not DOF. the bigger the opening, the brighter the viewfinder.....coming from the film era, I hate using small aperture lenses. "If you chose 85mm lens and 1/125 @ f/1.4 @ ISO100 on APS-C camera you will get same results using 130mm lens and 1/125 @ f/2.1 @ ISO200 on FF camera." Exposure has NOTHING do to with sensor size. If the exposure is correct for an APS shooting 1/125th at f/1.4 (no matter what the lens focal length) then if you shoot the FF at a narrower aperture, f/2.1 (again, no matter what the lens focal length) you will UNDEREXPOSE the image. Also, If you choose an 85mm lens and 1/125 @ f/1.4 @ ISO100 on an FF camera you will get same photo as with an APS-C camera assuming: 1) you stand at the same object distance, 2) the illumination is the same, and 3) the pixel size of each sensor is the same, and 4) the metering functions work identically. The field of view will nominally by 1.5 times larger in x and y and the depth of field will be the same. When you want to know why this is true, read an optics book. @OlyPent -- you don't understand the exposure either. There is no such thing as "underexpose the image". "Exposure has NOTHING do to with sensor size. If the exposure is correct for an APS shooting 1/125th at f/1.4 (no matter what the lens focal length) then if you shoot the FF at a narrower aperture, f/2.1 (again, no matter what the lens focal length) you will UNDEREXPOSE the image." I think you missed the part where they said ISO 200 for the FF camera will get you the same results. This is how equivalence works - you have to look at the equivalent values for all parameters, not just the one you like because it gives you the warm and fuzzies about "reach"
At 1.4 I can find areas in the frame where one beats the other and vice versa. I find the Sigma to have more wins throughout the frame at 1.4, but not by much. As soon as I go to 2.0 and up, the Sony seems to crush the the sigma. I mean crush. Am I the only one seeing or acknowledging this obvious fact? Also, I too was sick and tired of micro adjusting and still having front and rear focusing issues with all of my Sigmas ie the 35 and 50 1.4s. And the 50-100? Don't get me started. That lens teased me with it clarity when it hit but would front and back by not inches but several feet on moving subjects which had nothing to to with MA. After hours of adjustment this lens nailed focus in a controlled environment. But real world, way too many big misses. I dislike Sigma for the focus issues and lack of sealing and I dislike Sony for the price and I dislike Canon and Nikon for lack of IBIS and many other reasons. I noticed the same thing--there are certainly places where the sony is sharper and others were the Sigma is. I also see the vignetting in the Sony. Either is good. I wouldn't be surprised if you take another copy of either of the same model and you would see these or more imperfections. @TopperMcFly -- You expect too much from a portrait lens. I'm still perfectly satisfied with an old poor Canon 85/1.8 as it still keeps cranking up excellent portraits. I just sold the last of my Canon gear which consisted of a 7D MII and my Canon 85 1.8. It was my favorite lens in the world for it's versatility and portability. I expect much more from gear that costs much more than the 85 1.8. I also do not think it is too much to expect "more" from $1300+ portrait lenses. I am a speed freak and had to have all of the FE 1.4 primes. There is not a single one that I would trade for a larger heavier Sigma. I lost a lot of money playing Sigma roulette. They are just so damn tempting. It always came down to inadequate focusing systems. Issues that I do not have with my overpriced but excellent Sony lenses. I wonder if the cityscape was shot through a window? That might impact different areas of the scene. Why are you all speaking for the 85 mm as a portrait lens ? Ok, it is maybe a portrait lens but also a very good landscape lens or .... whatever you can do with it. So buy the lens according to your needs. A 85 Lens for portraits does not need extreme accuracy in the corners. If you shoot inna studio with a tripod, this sigma is ok because you do not need to carry it. If you shoot portraits outside, forget it. The question is all about the way you make pictures. Discussions about pure technical performance is irrelevant. I'm sure it's great, but so it should be at that size. I worry that the fight to have the best *testing* lens will drive lens sizes ever upwards, where the resolution and evenness advantages, while real, won't be noticeable in real world prints. I'm confused. Is this a test of the Sigma, or a comparison test between the Sigma and the Sony? You couldn't notice it is both? Well, no mention of the Sony in the title, and then it pops up all over. It's a lens comparison review with the Sony going up against the Sigma. Chris, than your title should at least say so. i wish to see review for the tamron 85mm f1.8 and how it compares with the sigma. Lame...let me know when it is f/1.2, has 4-stop image stabilization, and a 1:1 macro reproduction ratio (but needs to be under $1,000 as well). Looks like a super lens. But, every time I put Sigma lenses in my cart and am ready to hit the buy button. I am hit by the past of having to spend countless hours micro adjusting them. Sending them in for adj. just a nightmare. I hope they have ironed out the problems. Why is the first BW shot on the last page of the review presented in BW, while the colour one show the great purple charisma better? I personally liked the black and white rendition better and I had originally edited the photo as such. 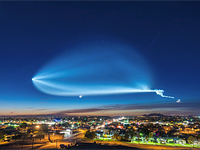 The original color photo is linked twice in the review and it's also in the sample image gallery (along with the Raw). What huge lenses! If I compare these lenses with my full manual Rollei/Carl Zeiss Planar 1.4/85mm... Don't get me wrong, of course I compare apples with oranges here. But as a former Olympus OM-2 user I hesitate to combine my Alpha-7 (Mk.1) with this new Sony or Sigma lenses. In my mind they fit on a 5D (e.g.) much better. One question. How is the focus accuracy rate? Or how many keepers do you get when compared to native lenses? With the Metabones adapter we didn't see a huge difference between the Sony GM and the Sigma; they both had roughly the same number of keepers. Which means that both are bad or good? Stop using those silly adapters and mount this on the Nikon D810. So how are you going to mount the Sony lens on the D810? "So how are you going to mount the Sony lens on the D810?" The Sigma is tested here, not the Sony, according to the title of the article. If you, you know, *actually read* the article you'd see that it was more of a shootout between the 85GM and the Sigma. mxx, it is more a comparison test between the Sigma and the Sony lens. If you are going to use it in a D810, then you will have to compare it with another lens you can mount on Nikon. Nikon 85mm perhaps? but looses it every other aspect. So now it is Canon's turn to deliver something really good - 1.2/85 mm - 1.8/85 mm - 2.0/100 mm - are not in the same league anymore. I agree. Why not mounting the Sigma on a 5DS in order to avoid any potential misalignment, and if you really want to compare at the same size, then downsize the 5DS pic to 42 mpx. I'm not sure that a lot of A7 users will specifically buy this sigma beast to use it on their mirrorless, and on the opposite, nobody can mount the Sony on a Canikon body. My question is, if not already mentioned, why would you not mount the lens a camera where an adapter was not needed? We have in fact done just that. There's a number of samples in the gallery taken with a 5D Mark IV. In order to do a direct comparison with what was the best modern 85mm prime in the market we decided to adapt the Sigma to the a7R II. Why not use Sigmas own MC-11 to mount the lens? I'm guessing because Sigma doesn't make a high resolution FF camera and before you comment, the APS Foven sensor is not as good as the 42mp Sony FF sensor. MC-11 is an adapter not a camera. 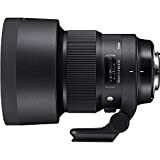 Sigma intended for the lens to be on a Nikon or canon why not compare the sigma to it true competitors and not just a Sony that most customers for this lens could care less about. @pkcpga because there's actually a number of folks that shoot Sony bodies with adapted glass and the Sony 85mm GM was the best modern 85mm lens on the market before the Sigma took the title. We compared the two lenses because they are currently the best of the best in terms of modern 85's. I wonder how many people will carry such a lens (the sigma lens of course) all day.. Pure performance has not much sense if you do not consider all the elements. The Fuji is for a crop sensor. Not the same. And I use the Sony 85mm GM. After a while I don't notice the size and weight. The 70-200mm f2.8 type lenses however I get fatigued after a while. Why do Fuji APS-C cameras pop up in the comments? I have some m43 gear that are smaller than the Fujis , the 42.5 1.2 for example, but what's the bearing? But the Canon is f/1.2 and still is smaller and lighter. The Sigma is a better lens but I find the size a put off and I'm used to big glass. I'd actually probably get the Tamron 85 f/1.8 truth be told. Still an excellent lens and competitive with most of these lenses and IS is most welcome at this FL. All of the current 85mm are sharp enough so with the Tamron at a fraction the price, size and weight it's ticks all the boxes and it's built better than the Sigma, which still can't even do weather sealing in this behemoth. Sigma can do very nice Weather Sealing but its kept for the Sport Lens. "Pure performance has not much sense if you do not consider all the elements." Like the Fuji being equivalent to an 85 f/1.8 you mean, which is a much more common and pedestrian thing than an 85 1.4 or 1.2? I've carried much larger lenses than this around all day and I'm 71 years old. "I've carried much larger lenses than this around all day and I'm 71 years old." Oh come on Sigma, make the Art series primes for Pentax too! Make them KAF4 mount, for the K-1, with electronic aperture, so you don't have to make pentax-specific components (aperture lever). No, they will not make it for Pentax mount. "Aperture lever" specific parts was only a lame excuse to drop the Pentax line entirely. I prefer the Sony due to less cats eye rendering and bokeh. 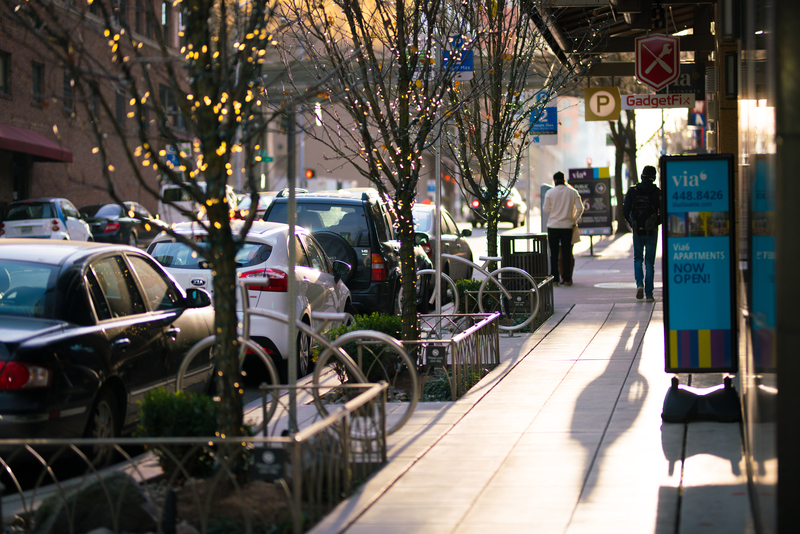 My impression in the image comparison (city) is that the Sony is sharper or more contrasty wide open. 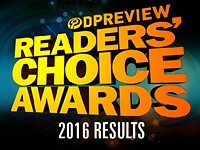 Did Dpreview exchange the labeling? But using both Sony A7rii and Canon 5div I will get the Sigma also to have an 85 for both systems. Hmm the Sigma looks sharper wide open to me, but the Sony definitely isn't too far behind. We didn't mix up the labeling. The Sigma is clearly better near the border and edges. When I look in the vicinity of the small green building to the right of the center building, you can see all the power lines and signs clearly (e.g. stop sign) with the Sony lens, but they are a bit blurred with the Sigma. Nevertheless, a very good performance for the price. That's most likely due to a lens adapter issue. As we pointed out in the beginning of that section; Roger Cicala has reported on this. Areas near the edges of the frame may experience some issues due to an imperfect alignment between the lens and the adapter. I do understand the size criticism but the same complains were made with Nikon 14-24 lens as well and later what happened every other Manf (Canon, Tamron, Sigma, Panasonic, Olympus) followed the same design. Tamron and Sigma really raised their game and provided us great value for money. Size critism is made on the context of Sony 85 GM, which basically gives you the similar optical performance, but with less size and weight. An impressive lens, but this is exactly why I moved from FF to Fuji. I get the same image quality as my former FF bodies, but with smaller lenses that are every bit as sharp and sometimes with better rendering characteristics. Everybody thinks that the camera they use is the best and is what everybody should be using. They can't all be right. Yes, Fuji defies physics all the time. But yes it will be better than canon 5D(older version) or nikon d700 but that does not mean it is equal of FF of these days. I wouldn't trust Sony's full weather sealing claim. The Sigma is dust and splash proof, so what's the difference then? Do you have some factual reason for not trusting Sony's weather sealing? I also remember a few occasions when they say "weather sealed" in their marketing materials, and later removed those claims. Sigma full-frame Art lenses are finally available in Sony E-mount. Here's how the 85mm F1.4 Art looks on an a7R III and a7 III.